Help yourself win more auctions and save money by taking a few minutest to read through this article. I have been playing on DealDash for over 2 years and have won hundreds of auctions. Every day I see people lose auctions because of the one simple bidding mistake and today I want to try and help you avoid this. DealDash has a feature called Bid Buddy which basically will do the bidding for you. All you have to do is enter the number of bids you want to use in the auction and click Book Bid Buddy. You can cancel at anytime and any unused bids will be returned back to your account – win or lose. Using the Bid Buddy will help you save more bids because it will only bid for you when there are no single bids being placed and during the last second of the auction clock. I use this to my advantage every time I bid on DealDash. 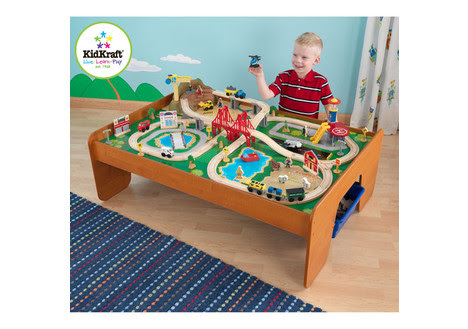 I was really interested in winning this train table for my son (pictured below). One of the other bidders helped me do just that because they were making this crucial bidding mistake. I can tell who is using their Bid Buddy and who is not. The people who are using Bid Buddy are bidding smart because they are conserving their bids and therefore more intimidating then the bid jumpers who single bid using the Bid Now button immediately after someone else bids. I was watching this train table auction every minute and once the auction hit $5.00 (the No Jumper limit) there were only two people remaining who were using their Bid Buddy. I waited for the right time to enter the auction and booked my BidBuddy. Sure enough there was a new person that entered in as well, however this new person was making a bidding mistake which would later cause them to lose the auction. They were going to lose because they were outbidding every other bidder until the price reached $8! I calculated they wasted approximately 150 bids because they were single bidding and not using the Bid Buddy. Due to this persons fast single bidding I was able to save my bids even longer and wait until one of the two on Bid Buddy left the auction before joining again. In the end I spent a total of 55 bids (at 15¢ per bid = $8.25) and won the auction with a final sales price of $8.31. Although this was a great strategic win for me, I do feel a bit sorry for the others who were bid stomping away with single bids while I had my Bid Buddy booked. Why weren’t they using the Bid Buddy? As for the bid jumper who was bidding every other bid from $5 to $8, they used approximately 150 bids which would cost $22.50 at 15¢ per bid. Of course they had the option to Buy it Now and get their 150 bids back however if they would have put their 150 bids into the Bid Buddy they would have out bid me for sure! To make a long story short – use your Bid Buddy to help you win auctions on DealDash.com. I’m sure there’s going to be other people making this same bidding mistake. Fortunately for us, we know this secret to conserving our bids which will help us win on DealDash. What Halloween Bidder Were You This Year? I hope those unfamiliar with BidBuddy will take a moment to read. So many people are anxious about winning they use the bid now button like it’s going out of style. It a waste of bids, a waste of money, and it does jack up the price. You are absolutely correct that smart bidders use BidBuddy, the automated bidder, to save bids. Usually, only new bidders make this bidding mistake of using single bids instead of BidBuddy. When I see bidders cutting the clock and casting bids every other one, I look at the date they became a member of DealDash and at least 9 out of 10 times, it shows they are indeed a Newbie who joined that day or earlier that month. Actually, anybody who has been using DealDash.com for more than a few days should already have figured this out. When I was a Newbie, it only took me a few minutes to figure it out, but I have actually seen people who have been using the site for a couple of years who still do not know any better. The main reason Newbies waste bids is because they cannot see the automated bidder from the home page, and they do not yet know they must double click on the auction item to open a new window to find and use BidBuddy. That is the key. They must double click on the auction they are bidding on to open a new window so they can see what’s happening.It’s like going back stage to meet the characters. I have seen many different characters on DealDash. The other day, I watched in amazement as four bull-headed bidders were in the same auction and refused to back down, even though all four of them were way over-bidding. I was just waiting for them to run out of bids before i placed my bids. It’s so important to watch and know the bidders. If you get four bull-headed bidders in the same auction, who all refuse to back down, nobody will end up getting a bargain. Once when I saw four bidders battling it out for a $100 Amazon card, I dropped out of that losing fight, placed my bids on another $100 gift card instead and won it for $2.50. Thanks for writing this article about the importance of using BidBuddy. Unfortunately, I doubt the Newbies who need this information the most will probably never see it.